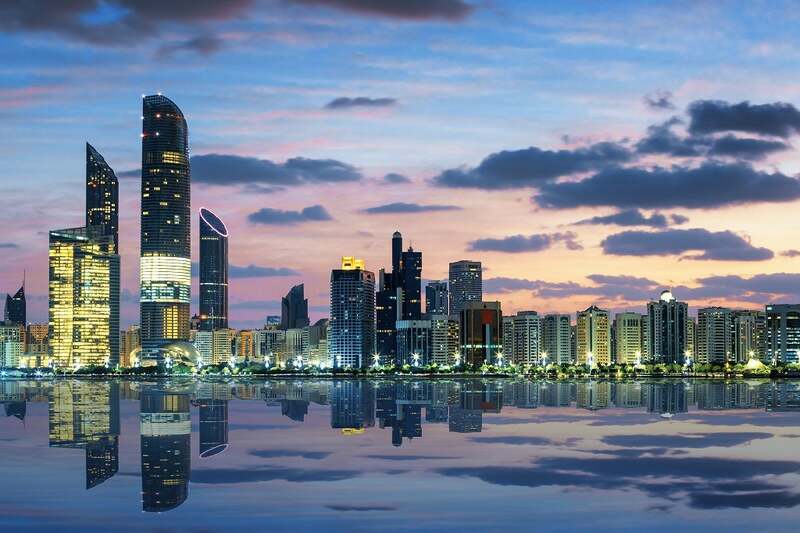 Abu Dhabi, the capital of the United Arab Emirates, has transformed into a thriving metropolis, owing to rapid urbanisation and high average income enjoyed by its population. Embracing an influx of over 70 nationalities over four decades, the city is the melting point of a vast number of cultures, ethnicities, and religions; giving you the opportunity to interact and work with people from all over the world. While Dubai has diversified its economy to incorporate a large tourism sector, Abu Dhabi is still very much a city built on oil revenues; not bad for what was once a small island pearling community on the coast of the Persian Gulf. That island is today covered in residential and commercial buildings and connected to the mainland by several large motorway bridges, but evidence of its humble beginnings remain in the city’s archaeological sites, historic buildings and museums. While the state religion of Islam dictates much in the way of laws and societal norms in Abu Dhabi, the population has enough diversity to make for a varied and complex cultural life. Arab cuisine is found alongside fare from south Asia and Western-style fast food. Christian, Hindu and Sikh temples neighbour the city’s many mosques. Football is more popular than traditional camel racing and, while the sale of pork and alcohol is regulated, Western-style dress and shopping malls are commonplace. If you feel like flaunting your beach body, be aware of the scorching sun of the desert during summer. The extreme temperature in summer can make it a difficult to adjust to the weather, with mercury rising up to 40°C (100°F) between June and September. Winters are rather pleasant with a moderate temperature of 24°C (75°F), rarely plummeting to 10°C (50°F) . Abu Dhabi is often overshadowed by its livelier neighbour, Dubai, but what Abu Dhabi lacks in infamy it more than makes up for in productivity; the city accounts for more than 50% of the GDP of the entire UAE and has plenty of well-paid roles in the gas and oil business. The emirate alone owns 9% of the world’s oil reserves and nearly 5% of the world’s natural gas; this has made Abu Dhabi the global city it is today – and the richest in the world according to Fortune magazine. You can find work in this sector from major employers like Abu Dhabi National Oil Company (ADNOC), Schlumberger, and Takreer, just to name a few. Though the economy of Abu Dhabi has long been centred around oil, expats can find jobs in other sectors such as aviation (Etihad Airways), aerospace (Global Aerospace Logistics), and the ever growing hospitality industry – because who doesn’t want to come to Abu Dhabi, really? In addition to the Abu Dhabi Education Council, there are over 100 private schools in Abu Dhabi, with more opening every year to meet demand. Unemployed expats are a rare thing as the UAE makes sure that those who want to live in the emirates must already have a job, or that an employed family member can sponsor them. Speak Arabic and second language? Bilingual workers may be at a slight advantage, but most jobs that require Arabic and English tend to go to workers from other Arab countries such as Egypt or Jordan. Speak three or more languages? Multilingual workers, particular in hospitality and aviation, can find suitable jobs in their fields. Most expats find jobs in Abu Dhabi through recruiters in their home countries, or can apply directly through some smaller company websites. Living costs in Abu Dhabi are on par with large cities around the world; though with the majority of employers providing accommodation, expats in the city and in Dubai have more disposable income than they would normally in their home countries. With an average monthly disposable income of around 12,000 AED, entertainment and restaurants are affordable, and travel is relatively inexpensive given the location of the region. If you are looking for a romantic, three-course meal for two in a mid-range restaurant you can expect to pay around 150 AED; however takeaway from a sandwich shop can be found for 15-20 AED on average. Buying groceries is usually the cheaper option, as it is in most countries, and you can purchase a litre of milk and a loaf of white bread for 5-6 AED each. Staying hydrated with a soda or bottled water will cost 1-2 AED each. Despite being an Islamic country, alcohol is available at certain locations; you can pick up a bottle of mid-range wine for 50 AED and a cold beer, imported, for around 8 AED, though these prices rise exponentially if purchased in a hotel. Staying in touch is easy, as the telecommunications infrastructure is strong in Abu Dhabi. For a little over 300 AED, you can get 6 mbps home internet connection with no cap, while 100-200 AED more per month earns you a package with TV. Considering that it costs an average of 0.33 AED per mobile minute, it’s best to get a monthly plan once you receive your residence visa. Grabbing a bus or taxi is quite cheap in Abu Dhabi, with buses costing 2 AED and taxis 2 AED per kilometre. If you fancy renting a car, you can do so for 1,400 AED a month with petrol costing less than 2 AED per litre. While accommodation is usually the most costly part of living in Abu Dhabi and the UAE in general, you will find that many employers take on this cost for their employees. What this means is that most expats will only have to cover electric and utilities, which only cost around 250 AED per month. For a one bedroom apartment in the city centre you can pay an average 7,000 AED vs only around 5,500 a bit further away from the centre. Renting a three bedroom apartment in the heart of the city centre is more expensive than one slightly away from the main hub of town with prices of 13,000 AED and 10,00 AED respectively. Generally speaking, the closer to city centre you live, the more expensive. The new developments in the suburbs of Khalifa City A, Mohammed bin Zayed City, and Al Reef Villas are good options for reasonably priced rentals and you’re never too far away from the sea. If you want to buy a home of your own when you move to Abu Dhabi, new studio apartments can start around 500,000 AED whilst 3 bedroom villas are a bit pricier at 2 million AED to start. Family-Friendly: Khalidiya – this area close to the Corniche in Abu Dhabi is a very popular expat area. You will find anything that you need from malls to grocery stores to frequently available rentals and take out food.Khalifa City is another newer suburb where many schools are being built and housing is more affordable. Mangrove Village is a quiet area close to the end of the island giving easy access to the airport and parks.Al Reef Villas is about 30 minutes from the Abu Dhabi city centre but it is close to the airport and has everything that you need contained within the community. Upmarket: Mangrove Village – this area has a lot of nice homes and villas and some flats but the price can be more than other popular expat areas such as Khalidiya.Al Bateen has big villas and parks and is populated mostly by locals. Rentals are not frequently available but if you keep an eye out and can afford it, it’s a nice place to reside. Hip & Trendy: Al Markaziya – this area in the middle of the island encompasses a large area and include several malls and hospitals.Al Reem Island – the apartment buildings in this area are new and upscale and have a lot of amenities such as marketing malls nearby. Up & Coming: Both Khalifa City and Mohammed bin Zayed City are located off-island with many new schools and homes being built that are affordable for families. Many businesses are located here, as well as the Zayed University, and these areas are still quite near the sea. Now you want to move to Abu Dhabi, but how much will it cost to move here from where you currently live? Take a look at a list of just a few of the many worldwide cost estimates for moving abroad to Abu Dhabi, based on the average moving cost for a family of four. Remember, this total price does not cover visas, passports or the cost of flights. So now you have your job sorted, but what will your kids do when you move to Abu Dhabi? Never fear, Abu Dhabi has 150 and counting international and private schools in the area; some schools even follow American, Canadian, British, and Asian countries’ curricula so your children can seamlessly pick up where they left off. The British School – Al Khubairat, American Community School, and GEMS schools (both American and British) are some of the most prominent schools in the city, with tuition rates generally costing 50,000 AED a year or more. If you are considering public schools, keep in mind that at present they are for native Arabic speaking pupils and that the school system is currently being restructured. Abu Dhabi is home to the campuses of some of the most prestigious international universities like NYU and the Sorbonne, while local universities such as UAE University and Zayed University are nothing to scoff at. Courses are normally taught in English at all of these institutions, as is the the current trend of most Western universities, and international students are frequently admitted to courses. Abu Dhabi is the more laid-back of the two major cities in the UAE, but it certainly has more than enough entertainment options for all but the most dedicated party animal. It is more affordable than Dubai, partly due to government subsidising petrol, electricity, and other costs. Since Abu Dhabi is smaller than its faraway emirate cousin, the cost of transport is lower, particularly taxis; however Dubai does have the added bonus of a fully air conditioned metro. Whether it’s a scorching summer day or a cosy 20°C (68°F) in winter, the first thing the locals do in the morning is grab a cup of strong Arabic coffee. For those who need a bit more in the mornings, the brunch phenomenon has made its way to Abu Dhabi: the Westin and the Fairmont are the most popular hotels for brunch on the weekends. If you are looking to feast on some delish pork BBQ, you can find pork products at Spinneys Market. Explore your new city by checking out some of the most unique modern aspects as well as the cultural heritage sites. Add Masdar City to your Abu Dhabi bucket list; it’s located near the airport and is entirely solar powered and carbon emission free. Other fun places to go are Ferrari World and Yas Waterworld, where teachers get in for free on some days and every Thursday night is ladies only. Top off the evening with a wide selection of Middle Eastern specialties, lounging on a divan and enjoying the company of both locals and expats in a shisha cafe or hotel bar. Ready to make the move to Abu Dhabi? Let us help you with that first step and get shipping quotes now.